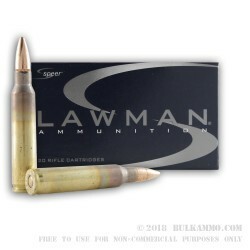 Speer Lawman ammunition is made to high quality standards to meet the training needs of law enforcement, but also serves as an excellent practice load for any gun owner. 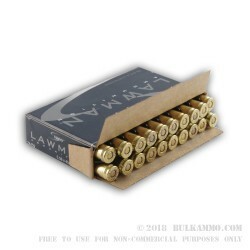 These 5.56 NATO cartridges for AR-15s and other rifles fire a 55 grain full metal jacket bullet and deliver external ballistics similar to that of M193 ball ammo. 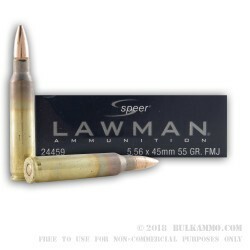 Like other Lawman ammo, these rounds are designed to provide the same recoil and trajectory as the corrresponding Gold Dot load. This ammo is loaded in Lewiston, Idaho using non-corrosive Boxer primers and reloadable brass cases. As with most 5.56 NATO ammunition, these rounds have visible annealing marks that showcase the correct processing of the brass. These marks are usually polished out in commercial .223 Remington ammo for purely cosmetic reasons. Q: Is this new brass or once fired. A: The brass used for this 5.56x45mm ammo by Speer is new manufactured brass. You may notice some discoloration around the neck of the cartridge. This is normal and is the result of the heat treatment process the brass undergoes while being shaped into this caliber. Some manufacturers will polish this away, while other brands like Speer and Federal will leave this on there. This will have no effect on the performance of the ammo or harm your rifle outside of normal operation. This brass is boxer primed which may be saved for the reloading process. Those who polish their fired brass may notice this discoloration missing after being cleaned.